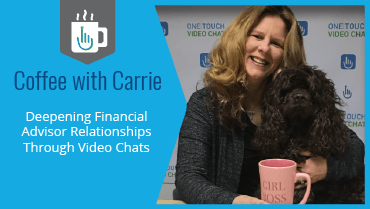 Deepening financial advisor relationships through video chat is the best way to deliver high-quality financial advice to hard-to-reach clients. Most financial advisors would agree that nothing can replace the value of an in-person meeting. Phone calls and email are natural substitutes, but both are ill-suited for difficult or complex interactions. The financial industry is a relationship business, where advisors build trust through face-to-face conversations and a handshake. But, in many cases, such in-person meetings are not possible. A client can relocate outside your local area, or an in-person meeting is simply too inconvenient for either of you. For this reason, financial advisors use live video technology to create and sustain financial advisor relationships with their clients. For financial advisors, video chat technology is no longer a “nice to have.” Clients demand it in their financial advisor relationship. What makes One Touch Video Chat different from other providers, like Skype or gotomeeting.com, is that we can build a customized chat widget on your website. Clients can connect with you directly on your own website for remote financial consultations. And they can do all of this without downloading anything, creating an account, using third-party apps. Plus, your chat widget will come FULLY BRANDED to your company, with your name, logo, and colors. Deepening financial advisor relationships through video chat have never been easier. From a client perspective, this is super convenient! Other video chat platforms require time-consuming downloads or extra links to chat portals. Our customized widget cuts out the middleman. For an industry built on trust, the ability to instantly connect with valuable, but perhaps difficult to reach, clients is an indispensable tool in a fast-paced digital age. Not all advisor websites are the same. Maybe your website doesn’t have the greatest technology or the same features as your competitors. However, you can surpass all those technological constraints if you are able to create that human connection from the beginning of your client relationship. Prospective clients that are looking for information about financial advisors often jump from one website to the next. While surfing through advisor websites, the prospect may text chat like someone on a website or send an email. However, the branded video chat portal on your website can instantly connect you with a potential client. In addition, with video chat technology, you will be able to see a client’s mannerisms, interest level, and buying signs. In fact, financial advisors who use video chat have enjoyed conversation rates that are three to four times higher than with online forms. Deepening financial advisor relationships through video chat gives you the competitive edge you need to engage with clients in a highly-mobile society. Click here to learn more about how you can improve your client relationships.